The Templar Alignment resemble priest-like or crusading warrior figures. They have varying effects revolving around arcane damage, abilities, and buffing/debuffing various things. 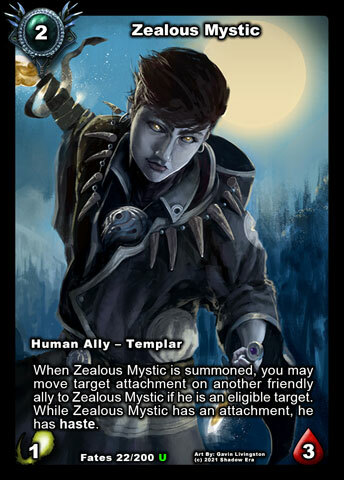 Notes: Zealous Mystic has proven to be very useful ally. 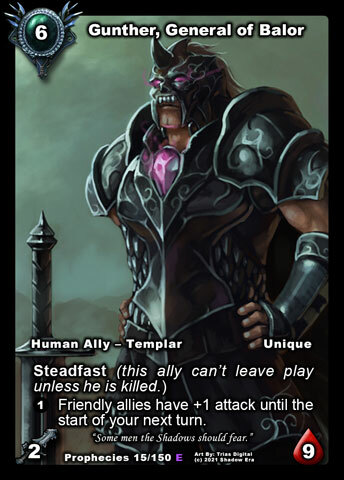 His main goal for inclusion into your deck is to manipulate Attachments, whether they be friendly or negative. He pairs most favorable with low cost and attack buffing attachments (Strength of Conviction) to maximize the value of his haste. You can actually summon the attachment on another friendly ally to use first, then summon Zealot to pull the attachment over for a second use. Zealots inclusion in your deck can also be a consideration as a replacement for A Legend Rises, allowing you to free up a friendly ally at a cheaper cost, however he adds an additional ally to the board which at times can not be favorable (Yari Marksman, Spirit Shuriken). Notes: Avenger is a very cool ally. He has some really good survivability for early game (4hp) which gives him some flexibility to combo with some cheap attachments. His passive ability generally means you are playing with other Templar allies which gives him a great utility for later play as well. Late game he becomes very aggressive allowing him to pair up with Haste/Readied at excellent cost to damage ratio. Notes: Unaxio Squire is very similar to Avenger of the Fallen as a Defending Turn 2 ally, but is a much better Turn 2 option play. Unaxio Squire is able to buff the attack of other allies, similar to Yari Bladedancer, however is different because it is a set buff number depending on the target. So this gives a bit more flexibility to cards that reduce attack to zero in that Squire’s ability buff is never affected. Additionally, unlike Yari Bladedancer, Unaxio Squire can have his attack buffed and be able to both use his ability and attack in the same turn. Notes: Currently Zailen Crusader is the most splashable Templar ally. The cost reduction of ally attachments creates a strong tempo swing and works with attachments that attach to friendly or opposing allies. You can find here typically in Warrior, Hunter, Rogue and Priest builds choosing to run some key class attachments (Crippling Blows, Hunters Gambit, Backstab, Silent Strike, Zail’s Hymn). She will grow in strength and flexibility as more attachments become available in later sets. 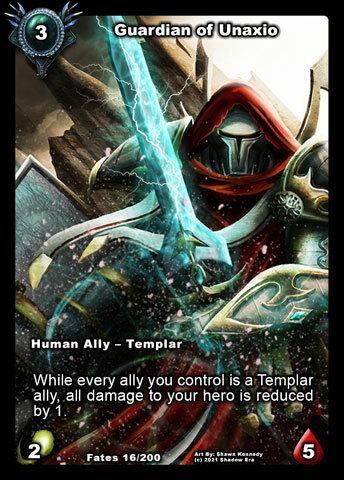 Notes: Guardian is a great Templar ally for Heroes wishing to negate some damage. He can be used to slow down a early rush, tech against Mages, pseudo healing and also helps to minimize retaliation damage to weapon based Heroes not delivering a kill shot. He kind of acts like a Hero protector in a way because he forces the opponent to deal with him first or have to deal higher damage over longer period of time to kill the hero. Very limiting as a splashable ally and would only be used in solo mode on the board. Guardian is not Unique so you can stack damage reduction to your hero. 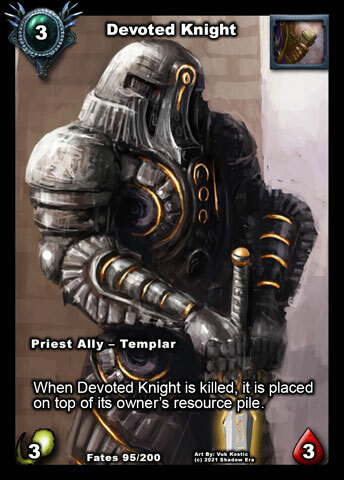 Notes: The only flavor to suggest that Devoted Knight is a Templar Ally is Arcane Attack and upon death Buffing your Resource Pile. Priest in general play with lots of high cost cards so having an ally available to help them get the resource count higher is certainly a good choice. Additionally Devoted Knight has some nice Aggressive Stats which would combo well with Haste/Readied, however the Priest Class is currently limited to Justicar’s Cape and Will to Fight as the only available options. Notes: Enters Combat Damage is like a limited version of Defender and also treated as two separate sources of damage. This creates a strong ally that has both offensive and defensive qualities. On defense, the enter combat damage allows for a damaging sources regardless of whether Sindarok Apprentice survives the combat phase allowing for chance to weaken some of the on board allies or deter some of the lower health allies. On offense the ability damage and combat damage are treated as 2 different sources so looses some effectiveness against armored allies, but against non armored allies you have a nice 3/4 or 4/4 ally (with a friendly Templar ally in play). 4/4 for 3cc is the strongest option currently in the game. If ability damage kills an ally upon entering combat you initiate, this still counts as your attack and will exhaust your ally. Notes: This is a fairly strong ally with a strong ability. Starting with base stats this ally is designed to survive so that you can use its activation ability. Being able to discard any ability card in your hand for cost of 1 is basically like Will to Fight for 1/3 of the cost but is tied to any of your ability cards and not requiring you to have 1 specific card in your hand. What is also nice is that Bannerman also has the passive granting +1 attack to your friendly Templars. This is also something that can stack, so you can literally drop Bannerman turn 3, then follow-up with Bannerman turn 4, discard an ability and have two 4/5 allies ready to attack. 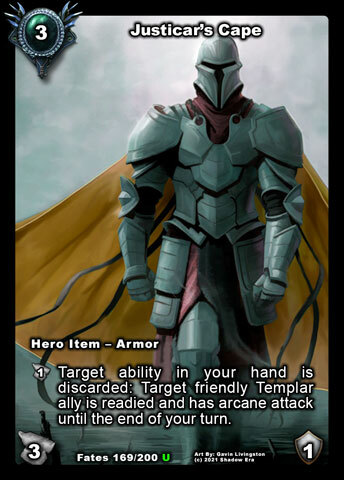 Additionally you can add Justicar’s Cape to this combo to make it even stronger, as well as add any of the other Templar discard outlets (Moment of Acquiescence, Knight of Unaxio and/or Sabreen). 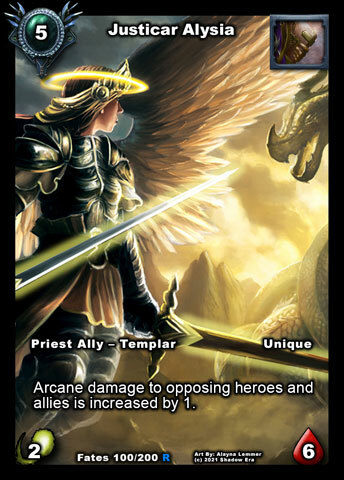 Notes: Sabreen, is an excellent bridge ally from the Templar alignment, combining Arcane, Haste and Ability synergy. 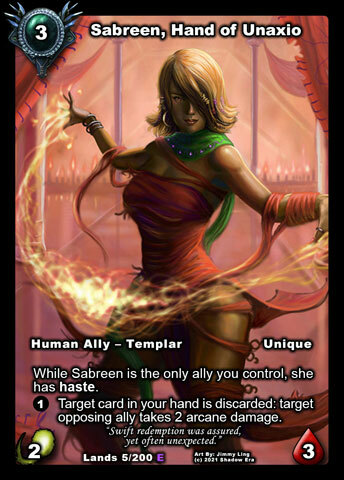 Sabreen is such a versatile ally being able to be used in many ways that she often appears in non-Templar decks. The conditional haste doesn’t really deter her usage as it can be used following a setup turn where generally your board may be empty. Her ability damage is also useful as it gives her utility to also bypass stealth and/or act as a pseudo ambush type. This does have a negative in that her ability and combat damage get broken up making it less effective against armored allies. Notes: One of the most aggressive 4cc allies in the game. 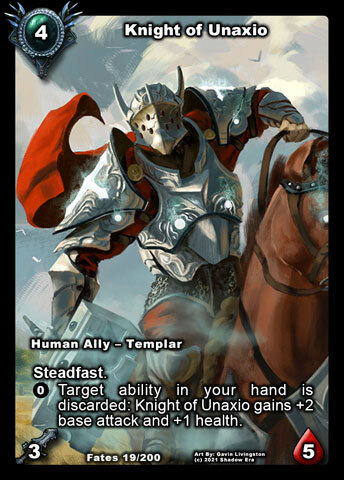 Activing Knight of Unaxio’s ability one time adds 4 total stat points (starts with 8) which basically makes him a conditional Fatty ally type (11 stat points is more on par with 6+cc allies). His ability can be used on additional Turns which can start to stack up fairly quickly if he’s not dealt with. He has Steadfast and creates some limitations for the opponent in terms of removal and helps protect the stat growth investment. His aggressive strength means he will favorably pair with haste, readied (potential use ability twice in 1 turn), ally protection and be supported with abilities to discard and draw to keep hand with options. Notes: Champion is an interesting ally. Essentially he becomes the Templar version of Furrion Terror allowing for some spread damage. Its a bit harder to achieve when compared to FT so having the damage only be dealt to opposing allies is a nice feature. The subsequent summoning damage is dealt individually (even with other Champions’ present) so there is loss of impact against armored allies. 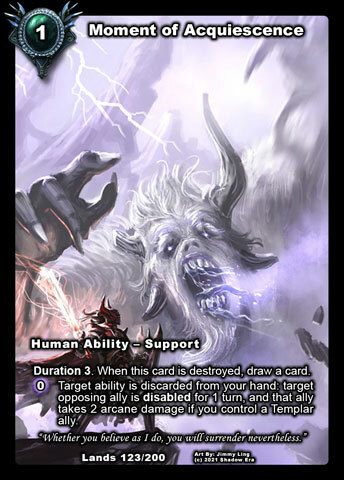 He will pair favorably with lower cost allies so you can summon (damage) more in a particular turn. 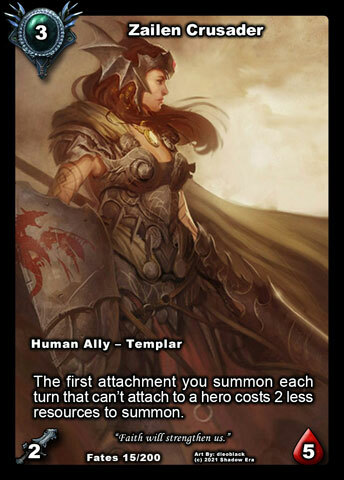 Notes: Paladin is one of the earlier existing Templar allies. He has an interesting ability to reduce ice and fire damage as well as remove negative effects so it makes him a great utility/tech ally. Typically you see Fire with Mages and Hunters. Ice is typically seen with Mages, Shadow Homunculus and Undead. The removal of negative effects can be handy as this removes: Enflamed, Poisoned, Frozen, Disabled, Can’t Attack, and Can’t Defend. Notes: Justicar is a very limiting ally. He is Unique so you cannot stack him. He has high cost so harder to combo play with. Only buffs Arcane Damage so you have limiting flexibility to use him. 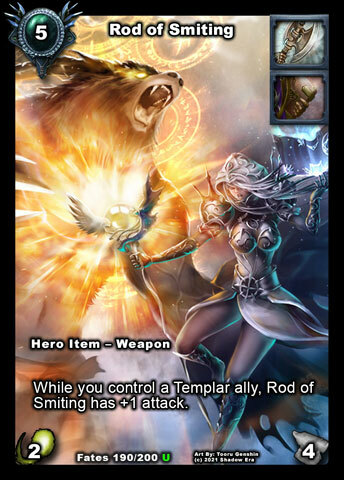 Threbin comes to mind as the best Hero to use Justicar with, being able to increase the damage done from his hero ability, as well as pair favorably with Weapons such as Madelain’s Scepter and Rod of Smiting. Arcane builds are also possible so he has a place with them acting as an Aldon type. His ability also increases his attack type so he is really a 3/6 as long as the passive ability is active. 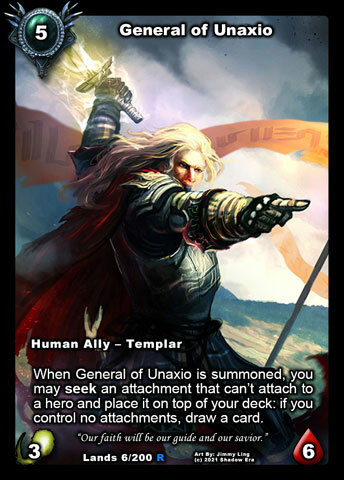 Notes: General of Unaxio is quite an interesting ally. He has a strong on summon ability allowing him to Seek an attachment. There is a new standard being built that will be Seek = 2SE, but General of Unaxio sits outside of that mold due to being a part of his on Summon ability. Meaning his summon cost gets him a body and Seeks attachment for cost of 5cc, and his body has some pretty durable stats for survivability. Lot of attachment based decks will gravitate toward this guy as he can help seek the right attachment for the right time allowing you to have fewer copies of a specific attachment in your deck creating more versatility without necessarily having to increase cards in your deck. He also has some arcane synergies. Notes: Honestly I have never used or even considered using Gunther. He got big health and steadfast which helps to make sure your opponent can not easily retreat him. To me this generally translates to a great protector ally possibly for Tala. The attack buff is ok, and is going to pair best with cheap hasted allies on turns following Gunther’s survival. You can get the same +1 all purpose attack in other way which are cheaper (Aldon, War Banner, For Unaxio!) and easier to accomplish so I am just not that interested in the overall investment. However, if the attack gain were permanent buffs I would then consider using him. Notes: This is one of my favorite attachments in the game. First it is super cheap and easy to combo onto allies and generally does not require the assistance of Zailen Crusader tempo wise. +2 attack boost (to Templar) is huge for such a cheap cost, especially since you can manipulate it with another cheap ally Mystic Zealot to get really good value. Also pairs with Haste/Readied allies to get extra big damage or can be used as one of the Templar ability discard options. Notes: I like to use Alignment cards so this is an excellent draw source for me. 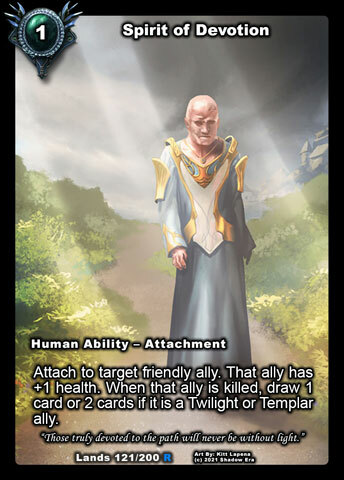 This is a card you are likely to see in a Templar deck as it has excellent draw/cost ratio, and Templar decks generally use attachments to feed their tribal synergies. Spirit of Devotion only requires attaching to a Templar Ally and dying, which is harder to do when compared with Twilight allies. The super low cost means you can generally drop it same turn with an ally. The ally Spirit of Devotion is attached to will need to die in order to achieve the draw so it’s important to think about the ally you are attaching this to. Notes: This is one of my favorite ideas for a card. I really like that this is a support ability and it also contains an activated ability. While the passive of the card really doesn’t do much while the card is in play, it does eventually replace itself when Moment is destroyed basically paying for itself. The activated ability is cool since it grants you the option to discard a card and disable an ally for a turn. This actually make Moment useable outside of the Templar alignment, however the bonus for using Templars is this will also grant some arcane damage to the target. Being a support ability, this could really work with Ravenscrest decks, and the discard synergy will work with discard theme regardless of Templar based or not. Notes: This is a draw engine design to work around arcane damage. 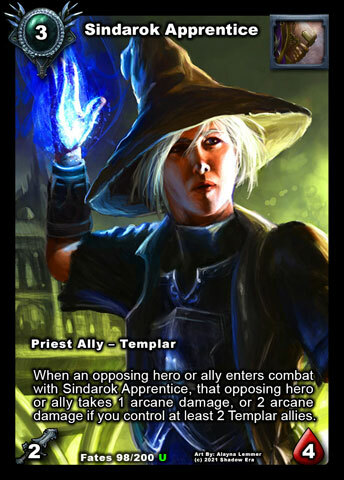 Currently the majority of arcane damage can be found with Templars and Priest with Mages and Warriors each having access to 1 card, Arcane Blast and Rod of Smiting. The low cost of Scriptures of the Righteous make this a fairly easy draw engine to set up and with a variety of ways to deal arcane damage it is also fairly easy to draw off of too. Also on the turn you use your last durability, you can actually play another Scriptures and draw off it due to meeting the conditions of the turn. Notes: Readied is one of the strongest abilities in the game. The Shadow Era Rule Book defines “Ready” – The act of making an exhausted card no longer exhausted. Basically Gondorian likes to refer to Readied as Super Haste. So this is interesting ability because you can use it as a haste type effect (on turn summoned), or you can use on an ally that has already attacked and used ability to essentially allow them to perform their turn all over again (double attack/abilities). 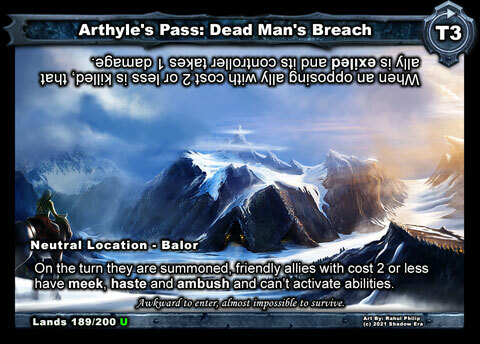 Haste blockers such as Braxnorian Soldier block keyword Haste and not keyword Readied. 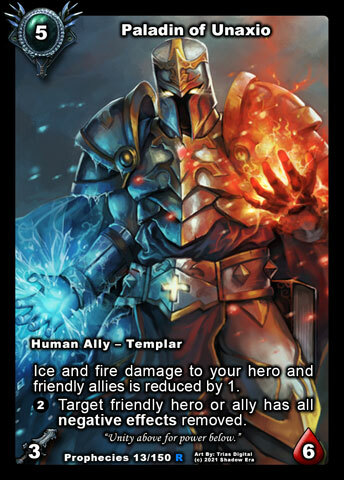 The attack type being converted to Arcane is cool because it can be used to temporarily convert your sword Templar allies to synergize with other possible Arcane effects your deck may have. NOTE: This is an armor and is able to be used with Aramia’s Hero ability. Also other general known use is with OTK Lance playing with support abilities to stall then haste in a Knight of Unaxio and get haste and readied use from him. Notes: 5cc for a 2/4 weapon is pretty standard for a vanilla weapon, however while you control a Templar ally this becomes much stronger. The Templar Ally acts similar to Reserve Weapon in terms of buffing the weapon but allows for a different tempo play (another threat on the board). The combat type is Arcane so this can be used in Arcane builds as well as receive Arcane Damage Buffs. The +1 while you control Templar is a Temporary Buff and does not stack if you happen to use Ambers ability on Rod of Smiting (4/4 not a 5/4 even with a Templar ally in play beforehand). Amber can still use this weapon if she opts to also play with SE sinks. Notes: This is a very complimentary location to aide the Discard Theme of the Templar alignment. You get a 1 for 1 trade (discard/draw), but the draw is immediate allowing you to fish for other cards. Combined with other synergies, such as Unaxio Bannerman, you can gain some other benefits. 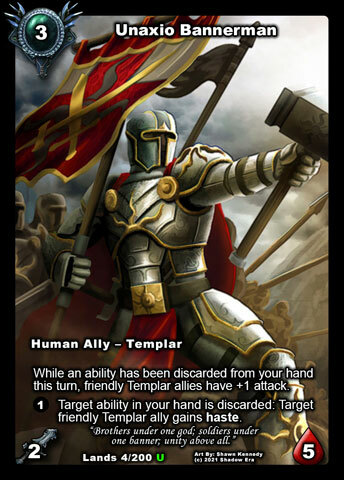 Also not being specific to Templar you could possibly do a hybrid discard themed deck to some potential. 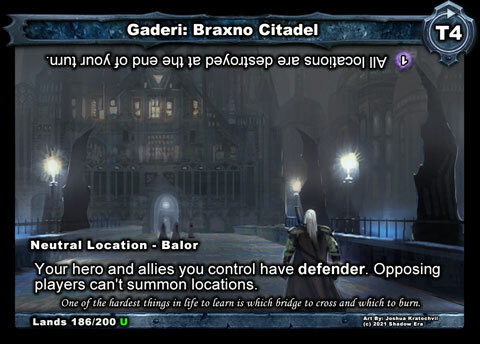 Notes: Templars have a variety of ways to buff both attack and health making Braxno Citadel an interesting choice. with the right combination of cards you can punish your opponent. Example, Sindarok Apprentice with Strength of Conviction can deal 6 (total) damage to opposing allies which is enough to deal with a majority of allies with 4cost or lower. 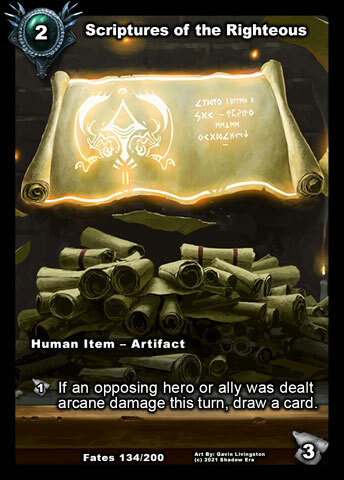 Additionally it can be used with Templar Champion to hold off opposing allies for a turn, then follow up with friendly arcane damage by summoning more allies. I believe there is a lot that the Templar can explore with this particular location making it an excellent choice. Notes: Templars have a lot of excellent allies with cost of 4cc or more, all of which can benefit greatly from a reduced summoning cost. General of Unaxio costing less and still being able to seek attachments, which can be used to combine with various forms of Haste / Readied can create a nightmare for your opponent. The reduced cost is great to cheat your fatty ally in perhaps 1 turn sooner than your opponent. This could pair favorably with Voice of Winter or other strong Turn 5 control tools. 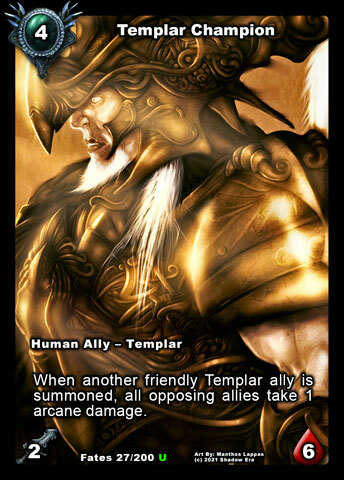 Notes: The Templar have a good number of low cost allies that can benefit from this location. Generally I see this more as a later game location. 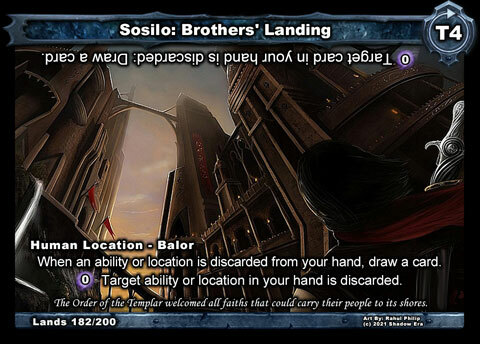 While Zealot Mystic does not really benefit from this particular location, Unaxio Squire and Avenger of the Fallen do. 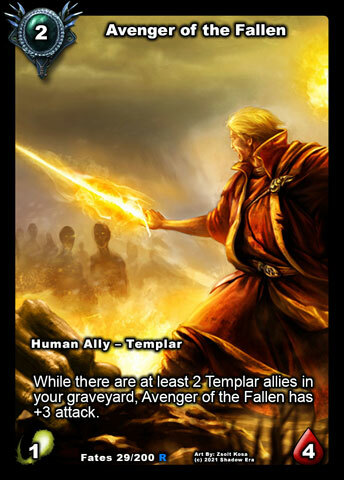 Once Avenger of the Fallen achieves his graveyard requirement he comes in swinging hard and has a low enough cost to combine with other allies and low cost attachments such as Strength of Conviction. Unaxio Squire can be hasted to use his ability to buff other friendly allies will still maintaining his ability too attack board with ambush. 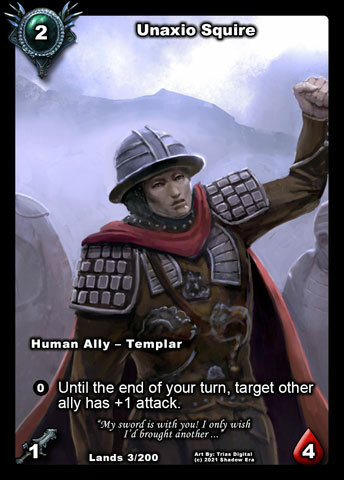 Notes: Valley of Secrets make the list since Templars have access to a great support ability, Moment of Acquiescence. 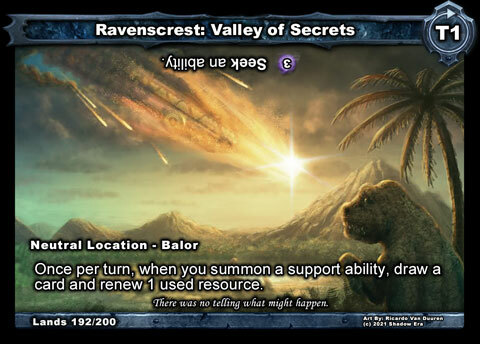 Moment is an excellent card to build around and with other good support abilities you can really take advantage of the resource renewal and draw. Also since Non-Controller can seek an ability, this make a pretty good tech location against Mages if you happen to also be running Guardian of Unaxio and Paladin of Unaxio. 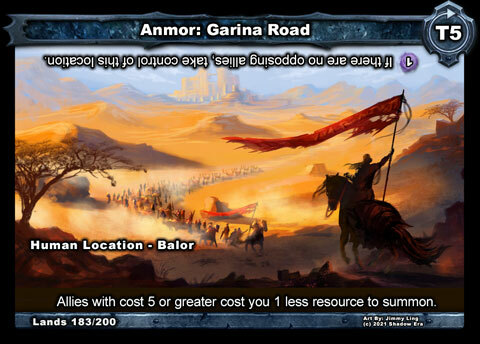 Tagged Abilities, alignment, arcane, attachment, Buqs, discard, religious, Shadowera, templar, tribe.